EDINBURG — Junior Quynne Huggins is in her first year with UTRGV, but the team’s conference opener at 7 tonight against UMKC will not be her first taste of WAC action. The game won’t even be Huggins’ first WAC contest in the UTRGV Fieldhouse. Huggins began her college career at Utah Valley, including scoring five points with two rebounds in 16 minutes at UTRGV on Jan. 9, 2016. The game was one of her last with Utah Valley, as a falling out with coach Cathy Nixon led her to leave the school after one season. Huggins spent a year at Mesa Community College before signing with UTRGV and becoming the team’s leading scorer this season at 11.0 points per game. Now, she’s preparing to begin the conference season nearly two years to the day after she first set foot on the UTRGV Fieldhouse floor, with aspirations to expand her game beyond the heights she’s already reached. Huggins finished her career at Utah Valley with just 12 appearances, averaging 4.1 points in 7.9 minutes per game. After facing UTRGV, Huggins played in only one other game, against Grand Canyon on Jan. 16, 2016. She described the environment at Utah Valley as stressful, as she felt she was always “walking on eggshells” around Nixon. Huggins said she missed practice time due to injury, then was suspended for academic reasons. She said she thought her academic responsibilities were in order for the start of the new semester, and she felt she had done everything that was asked of her. Then, she was called into Nixon’s office. “The coach decided that it just wasn’t working out for me being there, and she released me in the middle of the season,” Huggins said. 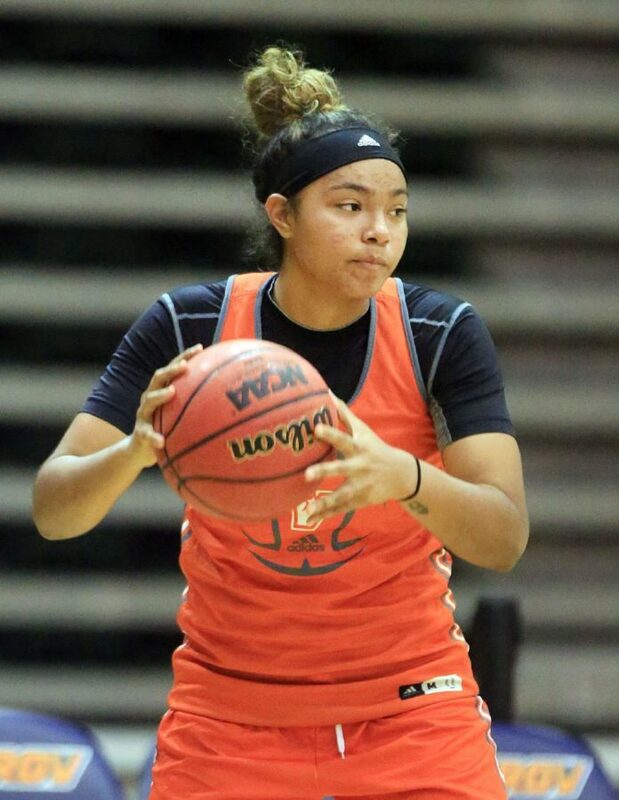 Huggins was then faced with a decision: she could transfer to another Division I school and have to sit out a year, or she could go to junior college and play right away. Wanting to get on the court after being so limited as a freshman, Huggins opted for Mesa, which is only about 30 miles from her hometown of Goodyear, Arizona. When the time came to find a new team after her year at Mesa, Huggins recalled her opportunity to play in Edinburg and the game she watched from the bench when UTRGV made its return trip to Utah Valley. One factor was an even bigger draw to UTRGV. Huggins paces UTRGV with 31 made 3-pointers and ranks fourth on the team with 4.3 rebounds per game, though coach Larry Tidwell believes she has the potential to be the Vaqueros’ leader in that category. Tidwell also praised Huggins’ versatility, as she’s played small forward, power forward and center for UTRGV. Huggins, who stands 5-foot-11, is the team’s leader in charges taken and is one of the squad’s two best shooters, Tidwell said. Tidwell expects UTRGV to compete for a WAC championship this season, and he said Huggins will have a leg up on most newcomers thanks to her familiarity with the grueling travel schedule. As a result, his hope for Huggins is sky high.